I agree with you on the connection of the pen to paper. I found that my creative writing process is better with handwriting and hand drawing. I tried fountain pens and cannot make them work as well for me. I am very picky about pens. The ink has to flow fast for me. To this day, my absolute preference for writing is still a graphite pencil. I used the same Pilot 0.5mm automatic pencil from high school until way past my graduate studies. I still have that Pilot 0.5mm but now I have fallen in love with the newly re-introduced Palomino Blackwing 602. Absolute joy. Just plain happiness with paper. I don't care about the price for pencils anymore. That's just my choice. Joel, I still have - and occasionally use - the Parker 45 I had in high school ... teeth marks and all. For a few years I use ball point pens, but eventually drifted back to fountain pens. In my day-to-day consultations, taking notes and histories of patients, a "wet" fountain pen flows effortlessly. Broad nibs carry more ink and float across the page. Stub and flexible nibs allow for a variation in the stoke, similar to calligraphy pens. I actually enjoy writing notes, secretly ... my patients are unaware of this ... having a creative moment. A pen in hand when conveying a meaningful message on real paper in a stamped envelop will even creat marvel for the most techy young person. However, Joel missed the opportunity to champion the Blackwing graphite pencil for making shop notes, etc. American cedar and Japanese graphite combines to make these the king of pencils. In an era where most persons connot even properly manipulate any object, save a fork or an iPhone, Joel has my compliments for bringing this issue to new light. Words cannot express how much I enjoyed this post. The last time I visited TFWW I stopped beforehand at a pencil shop in Manhattan, and on the way out I overheard someone walking by say to their friend, "this is just the kind of useless shop you'd find in this neighborhood". On one hand I understand where they're coming from, but on the other perhaps more wistful hand I wish everyone loved pencil shops! What goes hand in hand with those who savor fountain pens? Ans. Calligraphy. A few lessons with a teacher will renew or awaken a real respect for history and letter form. It will also cleanse you of the thought that computer-driven V groove inscriptions are “OK”. What happens in the carving and coating of a well turned piece of woodwork can sometimes be shameful unless there is the same dedication to these elements as was given to the wood art itself. A friend gifted me with a blank journal a few years ago. I immediately bought a cartridge fountain pen, but before writing the first journal entry, tried it on lined paper. After all these years with a keyboard, my handwriting is abysmal. I could almost feel Mrs. Thompson (3rd grade, 1955) standing behind me with a comment. Practice makes perfect, and I'm not perfect yet, so practice I will. It is worth it. Joel, I enjoyed your blog about fountain pens today. I have used them for years with joy at my desk when making notes etc. I have a good number of fountain pens, but my favorite is a Namiki retractable fountain pen with a custom modified italic point. Using these heirloom pens brings back fond memories of my years in grammar school in the 50’s using my trusty and cheap green Esterbrook fountain pen, and always wanting, but never being able to afford the beautiful Parker 51. $5 then in 1952 money. I can read your cursive writing just fine. Enjoyed your thoughts as always. Do I detect you're a lefty, Joel? Try detecting that with a typed page. Excellent post, Joel. I, too, am an aficionado of fountain pens. I have wondered if there is a link between my passion for using hand tools and my preference for fountain pens. Maybe I'm just an anachronistic old fart, but if that's so, I've been one since my 20's. I’m with you, Joel. A nice fountain pen is how I do my thinking (I use a No 2 pencil and graph paper to sketch). I’m a fan of Pelikans with a broad nib. and this right here is why I make. fountain pens. Joel, Iagree and enjoyed drawing and writing with fountain pens. I ended up stopping because after changing cartridges the ink alway leaked. I bought some expensive Lamy pens and still had the problem. I also wonder if my connection with paper comes of growing up before computers. Joel -- I so agree. I have used Mont Blancs for close to 30 years. One of the tips for success with any fountain pen is to use very smooth paper. A good fountain pen nib on cheap rag paper can catch on the paper. I use my computer a lot, but when I'm writing personal notes or letters, I almost always use a pen. When writing with a #2 pencil I use the Palomino BlackWing 602. Smooth writing, it is. Sharpen it with a Palomino Blackwing sharpener. A 2 stage/step sharpening process that gives it a sharp point that lasts a bit longer. In the shop, or anywhere woodworking, I use Staedtler norica HB2 pencils. In a Staples store they are $9.99 for 36. They have a darker lead than the yellow Dixon Ticonderogas. Although the Dix Tico #2 HB Soft come close. But, I really like the Staedtler noricas. On line, at Staples, they charge $13.99. Cheaper by far in the store. Joel -- Do you use water based ink or permanent? I'm sorta with Daniel Burgoyne on this one: I absolutely love mechanical pencils. Pens are fine, but I like the feeling of pencils, writing on paper, whether it be doing a Sudoku, crossword, Jumble, drawing, jotting notes, whatever. I've got a phalanx of mechanical pencils collected over a lifetime of work, some cheap plastic and some nice ones: older Pentels and any Koh-I-Noor I could beg steal or borrow. Yeah, I'm like that sometimes. I'm not a Luddite: I worked in IT and have used a PC since 1981, but for some things, the old surpasses the new. Hand tools, hand labor, hand drawing. Various drafting pencils are also a real tactile experience, and sharpening them is reminiscent of sharpening chisels and gouges. Except quicker. So, here's to your fountain pen, and to my mechanical pencil. I'm loving this post. I write EVERYTHING with a fountain pen, even if it's to be typed later. This includes my books, articles and the book reviews I write for Highland Woodworking (sorry for mentioning a competitor). There is just something about the tactile connection between pen and paper that's engaging. 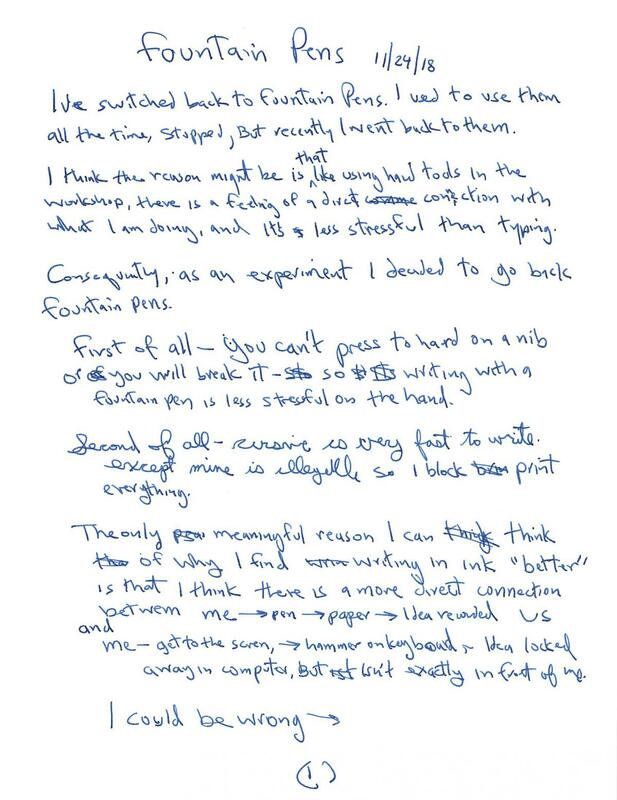 And frankly, I find I think better if I take the extra time to reflect that writing with a fountain pen gives me. It's not that I'm anti-computer; I'm not. I've worked in computers since the 60's and built a career around them. Pens just have a special place in my life that I'm not willing to give up. And yes, there's a connection with woodworking. Just as I have an ample collection of fine fountain pens, I also have a fine collection of handplanes, both metal and wood-bodied, that I love to use. You hit a sweet spot, Joel; and a new store item. So, what paper do you "float" on? And, how many shirts have you ruined, or stained? That second question is a non-issue because I happen to prefer a Uni-ball Roller Micro (.5mm) in Blue. But I can't find them anymore. Not cheap for office use so years of procurement was from the locked stash of Ms. Supplies. A whole lot easier than fountains and resolve the shoddy paper problems. They do ruin shirts but only when the lid is left off, or go through with the wash.
My all time favorite is the No.2/HB in cedar. My writing is cleaner than those scratch-outs you are fond of, and the things require more succinct scribbles to comprehend. But, hand days suddenly vanished when a monitor showed up on my doodle mat. 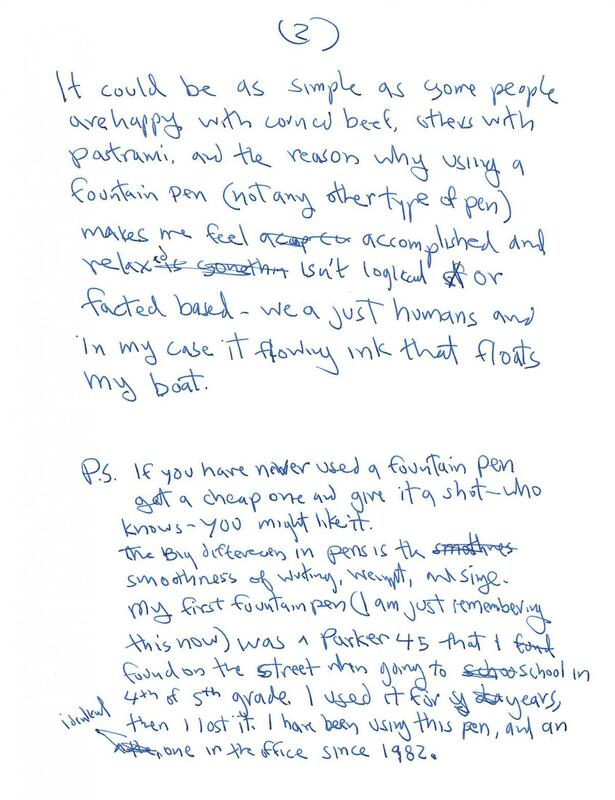 No, I never favored a fountain pen and gave them away immediately after forgotten memories re-surfaced. I understand that feeling. My mechanical pencils were retired when I discovered the joys of using Black Wing Pencils. There is something very therapeutic about sharpening the pencils with a Kum sharpener. The ideas seem to flow when not encumbered with a keyboard. Thanks, Joel, for the reminder. I do love writing with a fountain pen, though I usually get frustrated and quit because I get ink all over my fingers and make a mess. I rediscovered fountain pens last year and go to gouletpens.com often. Just received some noodles pen ink which comes with a free pen. The noodler ink guy is very interested reminds me of some of the eccentric hand tool makers. I love fountain pens. Was forced to use one while living in Belgium (1970) in the 5th grade. I could hardly understand French, the language of instruction in my school, so the pen with its various parts, cartridges, nibs and ink bottle, was a fascinating tactile distraction. I've used them ever since. I'm building a maple, ash and cherry stand up desk with a special drawer to accommodate three bottles of Mont Blanc ink. Ink on my fingers is like plane-shavings on the floor: a sign of good work.